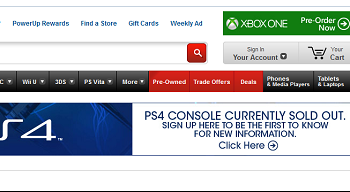 GameStop is stopping PS4 pre-orders as supplies for the new console run out. For a console that is still months away from release, the PlayStation 4 is doing pretty well for itself. Since pre-orders became available the new addition to the PlayStation family has been selling like mad, helping (along the with the Xbox One) to push Amazon's hardware sales to a whopping 4000% increase over what they were at this time last year. Amazon isn't the only the retailer enjoying the spoils of the new hardware generation, though. GameStop has also been selling new consoles like hotcakes, taking advantage of what leaked internal memos had previously described as an "unlimited" supply of PS4s. Now, however, the game-centric retailer has reportedly had to cap off PS4 pre-orders, changing the console's status on its online storefront to "Not Available." In-store pre-orders, in turn, are reportedly running out on a store by store basis. Comparatively, the Xbox One, which previously also had its pre-orders briefly capped by GameStop, is still available both online and in most physical stores. While it's still hard to make any conclusive judgments on the sales of the PS4 over the Xbox One and vice versa, it's become pretty clear that consumers were ready for a new a console generation. That being said, we're curious as to what our readers have personally purchased and what console sales are looking like in your area. Does the PS4 seem to be coming out on top? Or does your local gaming populace seem to be leaning toward the Xbox One?